With a lifetime pass you get A PASSPORT with FOUR Passwords, you can get them together or separately. Use the link on the side bar. Or you can purchase individual modules, & get a lifetime of access. Hit the Contact Us tab for the PayPal link. One module for a lifetime just $111.00. One module for a year, just $40.00. I have lots of explanatory videos to make and add. I also have several entry or landing pages to build. When the dust settles it should be much easier to navigate, to get started, & to know what to do next. Use the PayPal link below for individual Modules & please specify which modules you would like or use the PayPal Button & add a note. If you would like to buy blocks, the price list PDF is provided for your convenience. This page can be purchased separately for $111.00 for life or $40 Annually. For those who like books and manuals this is a great place to start. You get one password that works on three different Pages. The series a page has all 10 series a manuals (in read only format) along with videos to explain them. The password-protected PDFs page has a plethora of PDFs which you will find it useful and helpful for teaching this method. They are made specifically for based on blocks. This page also has all of my books, The curious counters compendium, supremely simple subjection, & divinely non-difficult division. The EZ PZ Page is a natural lead in to the P/T training and gives you an Bird's Eye overview of how the method works and what to be doing with your students and children. It also gives you an idea of when to introduce what and ideas on how to make learning 45 addends and 400 math facts as painless as possible...in fact move from painless to FUN. You get much more detail and hours of training in Module II. You get one password that works on exactly two pages. Parent Teacher Training: This Password alone is worth the price all by itself. You get hours of video training along with Pdfs to go with it. Winter Training, This is a training that I did by request at the end of 2017. Attendees paid $100 for this training alone. The page also contains four hours of math camp. 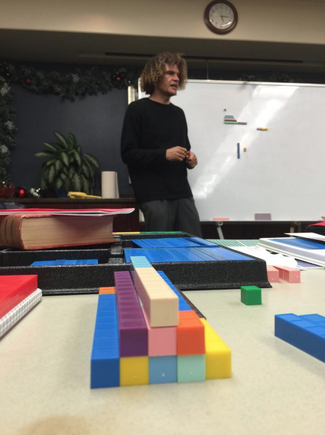 I did 20 hours worth (two, 2 week camps) but only four hours survived...These pages begin to put theory into practice, that only do you get training you also see video of actual students doing actual math, unrehearsed unedited. If you want results like the ones you see in the screenshots of comments you see peppered throughout this blog, then you may also want to come to a "live" video training or two. The Teacher training page is made up of videos taken directly from some of those trainings along with links to more pages and video and supporting pdfs that you can download. Also for those that have been through the training and are on facebook please go put some comments HERE. Prerequisite: either module one, two or even four. In other words you can't purchase this module by itself, only in conjunction with or after you've purchased one of the other modules. Sitewide: this is the password that gets you the most bang for the buck. It's the password that gets you into the most pages. People get confused because they think it gets you into every single page including parent-teacher training (which is module ii), series a manuals (which is module i) Etc. It doesn't. Don't worry the landing or entry page tells you which password to use. When in doubt use the Sitewide...But don't try to use the sitewide for Modules I, II or IV. Concepts. There is an introductory video, with a free lesson. This page covers five basic concepts and other basics & fundamentals that comprise the methodology, such as "the three period lesson." Password-protected PDFs page. This page has many PDFs, but it does not have the series a manuals or the EZ PZ PDF or training videos. Completing The Square: This page takes from the very basic starting with young children through all the various lessons you need to make this part of the algebra easy and understandable. I will also give you quite a bit regarding square numbers, square roots, dividing by two, squaring numbers that end in 5 and other basic foundational concepts that make math EZ and fun. This link takes you to the "start" of it, beginning with the FREE page. This is NOT a complete list, explore and discover--When in doubt use your sitewide password. If it doesn't work, email me for the new one but make sure you aren't on one of the three other modules first. For a complete list of pages you get with module three, simply click above or here. ***Side note: there are Free videos and training which you will find valuable on all of these pages. If you can count to nine, form a rectangle and tell me if something same or different or not, you should be fine on every single one of these pages. These pages are designed for the 10 and under crowd. This Trig page ALONE is again worth the entire cost of a lifetime password...I have heard that many times now. Getting people to comment and write testimonials is like pulling teeth. The fact that I have so many in and of itself should be a clue to some of you. Please go back and leave comments good bad or indifferent on these pages so people can see it's not just me. The Trig To Eight Year Old's Page breaks down basic trig functions like SIN, COS and TAN and make them concrete and understandable. Finding angles and sides is easy when you can get you hands on it and understand what the words mean and what the questions are asking. 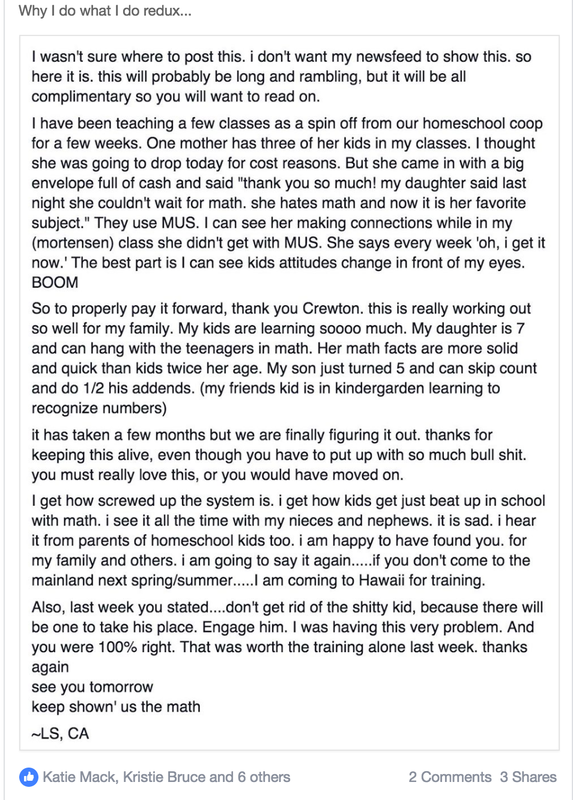 Actual lessons show you how to show your kids (or yourself) how easy trig can be. Derivation of pi. This is a presentation that again you won't find anywhere else. Shows you how to show why it's πr². Derivation of the Quadratic equation. Shows you how to use blocks & pictures to explain and understand the quadratic equation...So that's not just a string of symbols to memorize which mean little to nothing. Superduper Super Secret Facebook Page. This is a closed group on Facebook, where members get Advanced Access to pages, Lessons and Videos. Access to this page is not free. Just about everything that's in the Facebook Group is now included in one of these four modules. 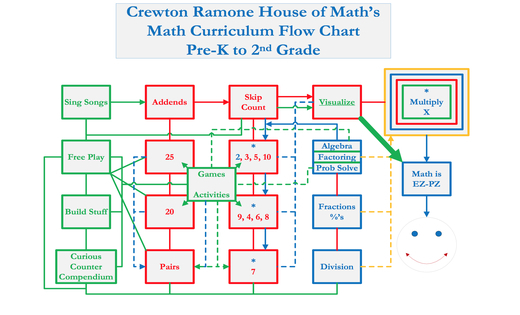 You get access to Honey Bunches of Math stuff, including Links, PDFs & videos forever for this one time fee. New stuff appears there first. Currently there are over 10 hours of Math Camp there, plus all of my books, plus more. Automatically comes as an added bonus if you buy all four mods for life.